Come celebrate The 4th of July with Clean Money Music!!! 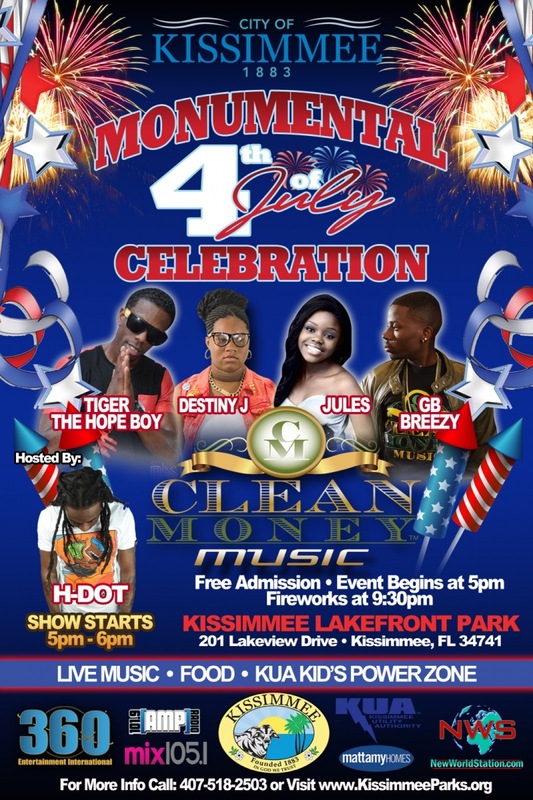 It's going to be a monumental 4th of July Celebration at Kissimmee Lakefront Park in Florida. Live performances by Clean Money Music's Tiger The Hope Boy, Destiny J, GB Breezy and Jules! Orlando's own H Dot will be keeping the party live! Yes, the Clean Money Music Family will be doing it up in a big way by getting the celebration started right from 5 to 6pm! You want more music! Soul Asylum, Tone Loc, Doubting Abbey, Supervillians and Ken Y will be there too. The party starts at 4pm and the fireworks at 9:30pm. There is going to be lots of fireworks, food and fun at Kissimmee Lakefront Park on the 4th of July!